Surgical teams use manual counting protocols to reduce the risk of a surgical sponge being unintentionally left inside the patient during a procedure. While these counts are a vital safety practice, they are themselves prone to error. In its 2019 Top 10 Health Technology Hazards report, ECRI Institute addresses the hazards associated with retained surgical sponges and recommends broader adoption of technologies that supplement the manual sponge-counting process. Surgical sponges that are unintentionally left inside the patient after the surgical site is closed can lead to infection and other serious complications, including the need for secondary operations. Although accurate data is hard to come by, available research suggests that every year thousands of U.S. patients could experience a retained surgical item (RSI), with surgical sponges being the most commonly retained item. 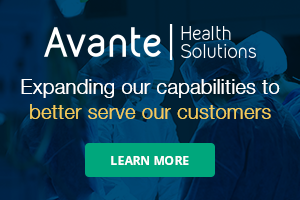 Subsequent patient health impacts, such as infections or the need for secondary operations. Prolonged surgical times when a sponge is, or is thought to be, missing. In addition to potential adverse health consequences for the patient – such as increased risks of infections, hypothermia, cardiac arrhythmias, and other postoperative complications – prolonged surgeries can lead to increased costs or reduced revenue for the facility. Financial and reputational harm to the healthcare facility when a retained surgical sponge results in litigation or negative publicity. Technologies that supplement the manual counting process are available and have been found to be effective when used correctly and consistently. ECRI Institute contends that broader adoption of these technologies could further reduce the risk that a surgical sponge will be unintentionally retained during a procedure. The prevalence of this hazard – along with the availability, and underutilization, of technologies to help reduce the risk – led ECRI Institute to include this topic as Hazard No. 3 on its 2019 Top 10 list of health technology hazards. The nonprofit research organization produces its annual list to raise awareness about critical hazards associated with medical devices and systems and to promote solutions that can help prevent patient harm. Manual counting protocols are standard practice for reducing the risk that sponges or any other surgical soft goods will be unintentionally retained within the patient. However, manual counts have limitations – the possibility of a miscount being an obvious one. For instance, staff may conclude that all sponges have been accounted for when in fact a sponge is missing. In this case, the surgical team might not learn of the discrepancy unless (or until) the patient returns with a complaint of pain or discomfort. Several studies have found that in the vast majority of cases in which an unintentionally retained sponge was later identified, surgical staff had thought that the manual count was correct. In other situations, staff may determine that a sponge is missing. Whether this determination is correct or incorrect, the surgical team must try to locate the sponge before surgical closure, extending the surgery and likely requiring an intraoperative X-ray. Technology options consist of a scanning device that can count or detect proprietary sponges that incorporate a detectable tag. These technologies can be used to aid in the counting and/or detection of sponges (and other soft goods), thus serving as a technological adjunct to manual counts. Counting, using a bar-coding system – These systems use a scanning mechanism to count uniquely coded items in and out of the procedure (i.e., before incision and then before any type of surgical closure). Detection, using a radio-frequency (RF) system – These systems can verify the presence of a misplaced or unaccounted-for sponge, which may be inside the patient or elsewhere in the OR (e.g., in the trash, on the floor). A combination of counting and detection, using a radio-frequency identification (RFID) system. Despite their apparent effectiveness, such technologies have not yet been implemented widely. ECRI Institute estimates that approximately 20 percent of the hospitals in the United States use some form of adjunct technology to supplement the manual counting process or to aid in the detection of missing sponges. It’s worth noting, however, that these systems are not designed to prevent retained suture needles, device fragments, or other types of RSIs. Rather, they address only surgical sponges, which are the most commonly retained item. While the use of counting or detection technologies is not currently required in the standard of care, ECRI Institute nevertheless encourages broader adoption of such technologies as a supplement to the manual counting process. Use the technology correctly – that is, in accordance with the manufacturer’s instructions for use. Use the technology in every procedure requiring the application of surgical soft goods, not just for selected cases. Remove untagged sponges from stock, unless there is no tagged alternative. Inspect sponges removed from the sterile field for tears, verifying that all fragments are retrieved before closure. Make confirmation of adjunct technology use a mandatory field in your facility’s electronic health record. This article supplements ECRI Institute’s 2019 Top 10 Health Technology Hazards report. An Executive Brief of the report can be downloaded from ECRI Institute as a free public service. 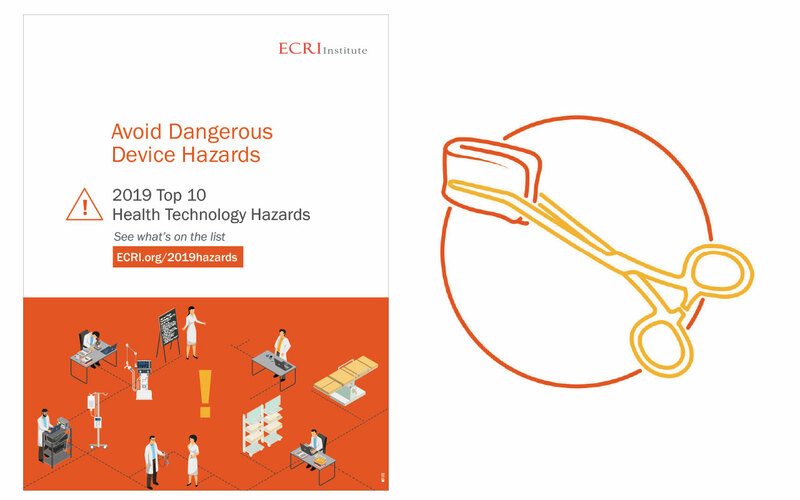 The full 2019 Top 10 Health Technology Hazards Solutions Kit, which includes detailed problem descriptions and recommendations for addressing the hazards, requires membership in ECRI Institute programs. For more information, visit www.ecri.org/2019Hazards, or contact ECRI Institute by telephone at (610) 825-6000, ext. 5891, or by email at clientservices@ecri.org.